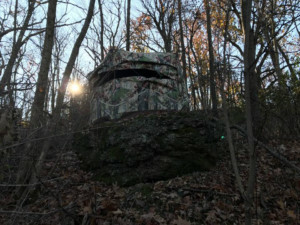 This portable blind fits perfectly on a large rock that overlooks a wooded bowl near Baraboo. Dan Durbin has hunted from that spot during the last four gun deer seasons. Despite fewer hunters in the woods this year, the 2018 deer harvest was up, at 211,430 deer compared to 197,733 in 2017. Better yet, it was safest gun season in history without a single fatality despite a blaze-orange army of 576,277 hunters in the woods. That paints a pretty nice picture for sure, but some hunters don’t feel that the numbers are accurate any longer because there is no longer a need to register deer in person. In reality, it’s awful easy for a hunter, either by choice or by accident, to not register their deer. 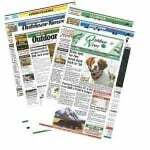 Other hunters enjoy the convenience of calling in or registering a deer online. I, for one, sort of miss the tradition of taking the deer in to the local tavern or gas station and registering it in person. It was a tradition, and a time when people who don’t know each other became friends over a conversation about their success or lack of it. I tore a tendon in my right hand and was unable to bowhunt this year, but the word on the street was that there would still be rutting activity during the gun season. My son Hunter and I were hunting in Baraboo on my dad’s and step-mom’s land, along with my sister Kristen and her boyfriend, Josh Lantz. For the last four years, Hunter and I set up in a blind on a boulder overlooking a bowl of woods. The deer don’t hold up in the spot much, but it is a natural funnel between a highway and some urban sprawl. During the rut, when bucks are cruising for does, they naturally seem to funnel through. During gun season, the deer do maintain some natural movement, but often times are pushed through from hunters on neighboring properties. 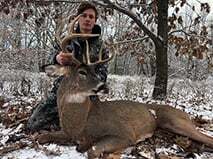 Hunter Durbin with a buck he shot on opening day on his grandfather’s land near Baraboo. We crawled into the blind about 45 minutes before shooting time. While I hate the idea of smartphones in a blind, it was interesting that Hunter was texting several buddies who were also sitting in the woods waiting for opening light. Mercifully, about 10 minutes before shooting hours, the cellphone was holstered and binoculars were picked up. About 45 minutes into the hunt, I spotted a doe slipping down the ridge about 100 yards away. “Dad, there’s a nice buck behind her,” Hunter said. Now any hunter knows that over the course of a 100-yard journey, that doe could have broken off about 100 times and lured the buck out of range. It was thick, and we’d catch a glimpse, and then lose them. Then we’d spot them again. About 50 yards away, the doe did exactly what we had hoped – she hit the trail that brought it broadside only 30 yards away. The buck was about 20 yards behind her and offered a quartering-on shot, but Hunter held off. The wind was in our faces and everything was coming together to put the buck right in front of us broadside. And guess what? That’s exactly what happened. Hunter squeezed off a shot that put the bullet right in the heart. Incredibly, everything went down perfectly, which is very rare when I’m hunting. It was a bittersweet hunt in that Dad and Winnie are probably moving next year, so a new camp will have to be formed – it was probably the last time I’ll see that big, blind-friendly Baraboo rock. It was tough looking back at it for likely the last time as we exited the woods, but I do feel blessed for the times my son and I had on that natural hunting spot. That big blind-friendly Baraboo rock. Sounds like a good name for a country music song, or maybe one Leon Redbone would sing.